Almost all of peerinstruction4CS’ content contributors will be in Memphis March 2-5 for SIGCSE 2016. 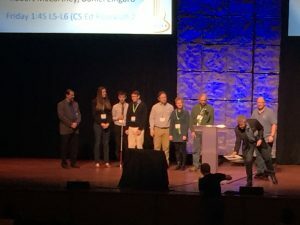 We are delighted and honored that research about PI, “A Multi-institutional Study of Peer Instruction in Introductory Computing,” has been named Best Paper! You can read this paper, and all our PI research results, on our latest research page. Do you find your students inattentive during lecture? Ever wonder what all the students are thinking, not just those few who ask questions? Do you want to see more of your students succeed and stay in the major? Peer Instruction may be your answer! Peer Instruction is a student-centric pedagogy which uses targeted conceptual questions (often with clickers) to identify student understanding. This allows the instructor to focus the class around core concepts and around material on which students struggle. Relative to lecture, research has shown it to improved student scores on final exams, dramatically reduce failure rates, and contribute to improve retention of CS majors.Moreover, students across a wide variety of institutions overwhelmingly value Peer Instruction and wish more faculty would use it in their classes. In this workshop, participants will attend actual Peer Instruction classes ongoing at UC San Diego, learn about the research supporting Peer Instruction and Peer instruction Best Practices, gain hands-on experience running Peer Instruction questions, and will work with experienced Peer Instruction instructors on adopting/developing Peer Instruction materials for their classes. https://www.surveymonkey.com/s/DD5TXPX After applying, we will respond to you shortly.